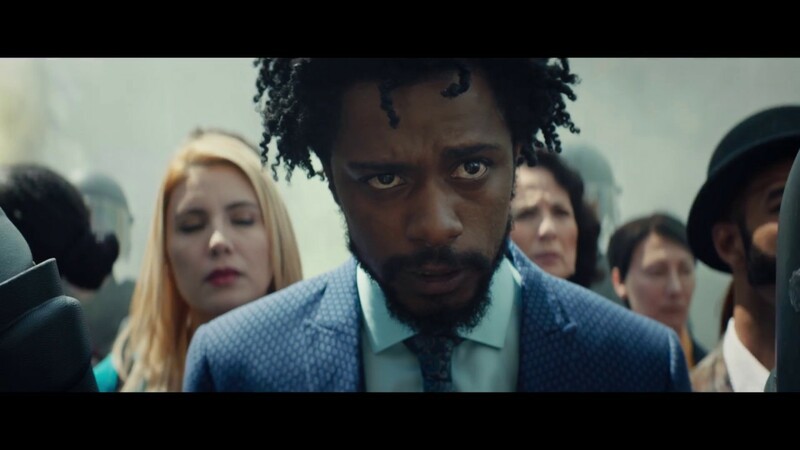 Cassius Green (Lakeith Stanfield) needs a break! He lives in his Uncle’s garage and doesn’t have a job. That’s when he applies for a position in a local telemarketing firm. The interview does not go well, but despite this, he gets a chance to show what he can do. He is struggling to make any sales during his first hours, that is until he starts talking to Langston (Danny Glover), who sits at the desk beside him. Langston explains that to make a sale, you must use your ‘white voice’. This is a novel concept, that you not only sound white but you also sound like you don’t have a care in the world! Cassius seems a natural at this concept and the powers that be spot his talents. This is set in an alternative version of America that is even more fucked up than the real one! There are hints at many sinister things, like the company ‘Worry Free’ who offer you a job and a place to stay for life. It sounds like a good deal but it is in exchange for signing a lifetime contract! The ’employees’ are little more than slaves under another name! One of the main themes of this film is social activism and the need to protest. Another essential element of the film is the soundtrack, which features both the Coup (director’s Reilly’s own band) and Tune-yards, who also scored the film. Tune-yard’s incidental music is really impressive and adds an extra element to proceedings. The soundtrack also features Janelle Monáe, Killer Mike, and more. Another great idea is that different actors voice the ‘white voice’ of the black actors, with David Cross playing Cassius’s white voice! A concept that moves beyond novel and into the bizarre. Riley is attacking many things in this film and some of them are unclear, but its hard not to admire his creativity. While Boots Riley is the writer and director of this film, he is also a rapper and activist. This film should make him a household name, as it is a very unusual work! It has a spark of imagination and flair that is rarely seen on the big screen, where the safe option usually wins out. The film does have an obvious comparison with ‘Get Out’ and it changes from offbeat comedy to horror as the film progresses. It doesn’t all work and some sections could have been cut entirely, but there is more than enough here to make this film a cult classic!